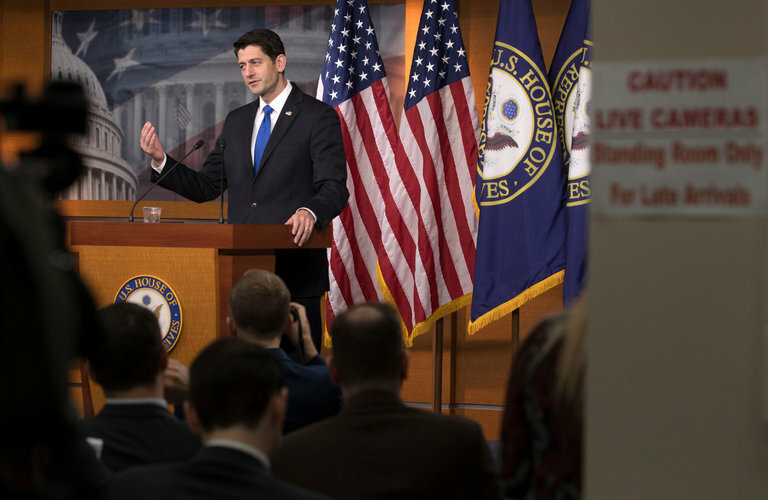 Speaker Paul D. Ryan said the House would go along with President-elect Donald J. Trump’s request and pass a stopgap spending bill that would keep the government running at current spending levels until March. WASHINGTON — President-elect Donald J. Trump is making his influence felt on government funding deliberations in Congress, pressing Republican leaders to postpone action on spending bills until after he takes office. Speaker Paul D. Ryan said on Thursday that the House would go along with the incoming administration’s request and pass a stopgap spending bill that would keep the government running at current spending levels until March. “I think they would like to have a say-so on how money’s going to be spent going into the next year,” he told reporters. But Republican leaders in the Senate did not immediately sign on to the plan, reflecting their desire to get contentious spending battles out of the way this year. Congress had been working toward agreement on spending bills by Dec. 9, when the current funding agreement expires. Senator Mitch McConnell of Kentucky, the Republican leader, left open the possibility of an agreement with the House. “Discussions are also ongoing about how to fund the government and for how long,” he said on the floor on Thursday. But signaling that the longstanding tensions between the House and Senate may not abate under a more unified Republican government, some Senate Republicans expressed concern that waiting until early next year could distract them from other legislative priorities. The issue flared as both parties on Capitol Hill continued to adapt to Mr. Trump’s victory and his promise to shake up the way Washington works. Vice President-elect Mike Pence visited the Capitol to meet with Republican and Democratic leaders, as well as House Republicans. And the House Democratic leader, Nancy Pelosi of California, drew a challenger on Thursday in her campaign to retain her post, as Representative Tim Ryan of Ohio said the election outcome required Democrats to take a new approach. Startled by the number of working-class voters in states like Michigan, Ohio and Pennsylvania that shifted their support to Republicans — particularly Mr. Trump — Democrats have spent the week contemplating how to recapture those voters. Mr. Ryan, 43, who represents the quintessentially Rust Belt area of Youngstown, Ohio, said he believed he could help Democrats reach them. 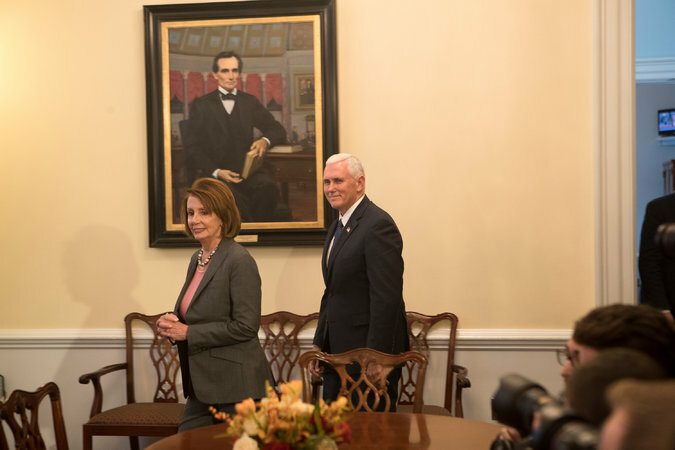 Vice President-elect Mike Pence met with Nancy Pelosi, the House minority leader, on Thursday. Not selecting new leadership, Mr. Ryan said, would lead to “more disappointment in future elections.” Ms. Pelosi, 76, has led House Democrats since 2003. In a letter to Democrats on Wednesday, Ms. Pelosi announced her bid for re-election and issued a warning to potential challengers, arguing she already had the support of two-thirds of House Democrats. Ms. Pelosi’s confidence is not without basis. A prodigious fund-raiser and effective negotiator, she has a strong and vocal base of support that on paper should help her easily defeat any challenges. However, members have noted a restlessness in recent days within the conference, where Mr. Ryan’s message seemed to be resonating, which could end up blindsiding the leader. Further, her loss in a similar, far lower-stakes struggle two years ago demonstrated cracks in her power. In 2014, a proxy battle between Ms. Pelosi and Representative Steny H. Hoyer, Democrat of Maryland, broke out over a top spot on the Energy and Commerce Committee. Ms. Pelosi’s pick, Representative Anna G. Eshoo of California, was defeated by Mr. Hoyer’s choice, Representative Frank Pallone Jr. of New Jersey, stunning Ms. Pelosi. But Mr. Trump’s early intervention on spending issues also highlighted the many challenges facing the Republican majority as it adapts to the priorities of a new administration. Referring to Mr. Trump’s desire to “drain the swamp,” Mr. Ryan halted an effort at a closed-door procedural meeting on Wednesday that would have lifted a ban on earmarks — the oft-criticized practice of allowing lawmakers to allocate money to specific projects in their states or districts — promising instead to hold a vote on the proposal early next year. It has been several years since lawmakers passed a spending bill in time for the beginning of the fiscal year. Since Congress passed a stopgap measure in September, appropriators have been working to wrap up an agreement that would extend through the end of the government’s fiscal year next Sept. 30 before the new Congress assembles in January. Senator Lamar Alexander of Tennessee, another Republican on the Appropriations Committee, was critical of continued reliance on short-term spending bills, which have become a regular fallback as lawmakers have failed to cobble together legislation palatable to both President Obama and the right wing of their own party. They are “a really lazy way to govern,” Mr. Alexander told reporters. “I would think the last thing the Trump administration would want to do is spend time cleaning up an appropriations bill that was supposed to have been passed in the previous year under Obama,” he said.